I am about to download this product to see if it can help with my current problem and here its. I attempted a system restore and now I get an error saying there has been a serious issue and machine keeps rebooting. The F8 button does not respond. Will this product help doing a system restore if not can you point me in the right direction ? It really depends on the error message you are getting. It can help with virus detection, mbr errors , partition errors and much more. But…I have just a question: is legal this disk? In the past I read somewhere that a windows PE disk require a license….. It is legal. All programs included are open source or shareware. I have never heard this. I will add that soon. In the interim you could always go to your portable apps menu > apps > get more apps and install it. It would of coarse only be available for the current session. For some reason the portable version doesn’t work either. There is a chance it could be related to running it in VMware workstation as opposed to a full boot, but I doubt it. I’ll check though. I have been working on making a 8.1 from WinBuilder but I am not to happy with it. Yours is very solid. I thought you put two wim’s into one but that is not the case. Are you able to upload just the 86 version? It would only be around 350 mega bits. I only use the wim part and boot to it direct from hard drive. I found the 2nd wim file. What’s recommended way to put this on a usb pen? Also, thanks Gandalf for the best winpe I’ve ever seen. I sideloaded lots of apps, most of which run as well on the flash drive as on my Win 8.1 desktop. Amazing. I want to start congratulating you on your work with this page and the great job with the windows 8.1 PE image. I have tried to integrate the Lenovo Powermanager in a Windows 8.1 PE image, but whenever I want to run it, I keep getting the message saying that “.net feature is not activated”. I successfully activated that feature using Windows ADK as described on the Microsoft page but am still getting this error. Can you tell me how I could successfully install the Lenovo Powermanager on the 8.1PE image, if that’s even possible? Could I somehow install it on my already existing 8.1PE image? that would be great! Great work, and thanks for sharing it with us! But could you be so kind and explain us how we can create (or how to modify your x86-64) a x86 only version? I will be posting an x86 only version soon. Thanx for your kindness, i think a lot of us do appreciate your effort! Is the x86 only version ready yet? should be available later in the week. Is there a way that you could make a 86b version only? I want to be able to put this on a cd just in case one of the PCs I am working on does not support USB booting. Also the .wim file seems to be very large with the 64b version included which takes a very long time to boot. I am CompTia A+ ce certified. I am alsso Apple Cettified. I work for a small PC repair shop fixing iPhones, iPads, Apple laptops and Windows laptops. 1: Can you please put a donation link on your website. I would like to contribute to your amazing work. The work that you have done is brilliant. I am doing a lot of Windows operating systems re-installations after our customers hard drives have failed. It takes many hours of then updating the service packs, software updates, driver updates, runtime medias installations and so on. Once this is completed I use the OS keys associated with the laptops or customers newly purchased keys to activate their windows. I would like to begin customizing my own OS images by including the service packs, software updates, drivers, runtime medias and any other software such as iTunes, Chrome etc. I understand that this will take a lot of time to prepare and create, but wit will safe a lot time doing the OS re-installs. I am new to the IT side of this industry. I sent you an email reply. As I stated in it, MDT 2013 would be a good choice for what you are doing. Can you upload the file somewhere else? Have you tried using pnputil in a command prompt. Specifies that the device driver is to be installed. Specifies that the device driver is to be staged in the driver store. Specifies the path and file name of the .inf file associated with the driver package. Even my snd is working “out of the box”…. Is possible to add BitLocker? Hi, I’d like to try this Os out for mining applications like cudaminer or yacminer, as well as sgminer 4.1.0. I’d need to install both nvidia and amd gpu drivers as well as cuda and/or the amd app sdk. Would be great if you could write a post on how to do this for others to try too, thanks its a great resource. Thx for the great work. Is it possible to install video card drivers permanently? I have looked through a lot of the messages. I can see that many want you to install the PortableApps in the wim file. I think the PortableApps should stay separate as then they can download more apps as time goes on. I was able to get netframe2.0 on my new install for WinPe8.1. I will share my homepage with everyone, but your work is great. Home page is http://prz42.dx.am/WinPe8.1_x86.html. Hi thanks for this great PE! Thanks for the wonderful PE. But i would like to add in a intel HD5000 driver for laptop use and dunno how to go about it. Please email me steps on adding new drivers. -i Specifies that the device driver is to be installed. -a Specifies that the device driver is to be staged in the driver store. drivername.inf Specifies the path and file name of the .inf file associated with the driver package. First of all, congratulations for your job. It’s really amazing. I wanna ask you if you could tell me how can I use explorer.exe as a shell in winpe5.0. I read lot of tutorials in internet but they don’t work. P.S. : Sorry for my English, I’m from Spain. Haven’t heard of Belarc. what is it used for? A link would be helpful. Will check it out. May possibly add it. What do you think? WIS (http://www.gtopala.com/) is like that also, very useful tools. SIW doesn’t work in Windows 8. and there is no portable version of belarc. If you really need to have it, you can always download it and install once booted into the PE. May be you should had the HWinfo portable app as part as your package. It does something similar and it works fine. But it’s easy to install too. Kudos on what you have going here. I am working on a similar project creating a “utility knife” WinPE disc. I want to gather many tools, licensed and OpenSource, that we use on a WinPE disc. Would it be possible to get some how to’s or reference notes from you? Suggestion ; The Qdir portable app will be nice if included in the release. I will check out Qdir. Under properties > wifi make sure your wireless zero service is started. Hello gandalf50, no sadly that’s not working, the device is not recognized so it’s not even in the list. Ah well, I am not sure how you construct your release but this particular driver seems missing (ralink 2870). No big deal though, I will use the French version for that computer. Thanks a lot ! …suggestion 2, CCleaner (system cleaner) does not make much sense in a temporary portable OS. I will ditch it (my humble opinion here). Is there a way to get Win8.1PE to generate a random computer name when starting up? Since the same computer name is used each time, a name conflict can occur if more than one PC on the same subnet is booted into the Win8.1PE environment. This will be included in the upcoming version. Is there a way for your Win8.1PE to randomize its computer name upon every boot (similar to a standard Windows PE with the prefix “MININT-xxxxxx”? Booting two PCs at the same time with your Win8.1PE causes naming conflicts on the network. The next updates will use a random computer name instead of static. Well, it’s nice if you can make a x86 version for someone have 1GB USB. are you still planning to do an update soon ? I use Windows 8.1 Embedded as my main OS, any future release using the 8.1 Embedded as source? I like the speed and how light it is. i am trying to build my own windows 8.1 pe with the help of win8.1 PE SE. Almost everything works except Teamviewer. But Teamviewer is crucial because this will help me giving support to my parents. I tried it with the portable apps version but still the same error. You should put tools such as product key viewer, wifi key viewer, or a tool to have passwords removed from windows log in(xp,vista,7,8) those are useful tools and PC Wizard 2013. Why is the sys info not showing the correct processor and memory information? Doesn’t seem to always work. The latest version http://windowsmatters.com/2014/05/15/standalone-win8-1update_pe-x64-or-x86-2/ has HWinfo which shows the correct info. Thanks for the great winpe 8.1, love the included apps, but was wondering if you can add crystal disk info portable to the iso. may be a dumb ? but will this work on win 7 machines? First off, thanks for this awesome windowspe 8.1. Let’s not forget that this is a PE. Newbie question. Where does the administrator profile come from? I’d like to customize it a bit. Thanks a lot, after building my own and was looking how to incorporate explorer shell I found your build, well done, much much appreciated. I notice this new PE 5 takes longer to load (3min) on older computers such as Dell Optiplex 780 and older, any suggestions? My other PEs took less about 1min with drivers and GUI. can i change language pack in this ?? how ? Is there a way to mount a DVD burner on my machine? I downloaded this because my system lost it’s boot manager and its a fantastic build. I got my iso for Win 8.1 but I can’t burn it to disk – Control panel shows the drive. Your WINPE setup is awesome! I am a first timer to it. Definitely will be donating to your coffee fund. What would you recommend as the best way to get 8.1 from a spinning drive cloned to an ssd drive? Gimagex to create a wim file? Thanks again for all your great work. Saved me a bundle of time! I like drive snapshot which is included on the iso. Instructions for using it http://www.brighthub.com/computing/hardware/articles/96287.aspx If the iso versions has timed out there is a link on the desktop to download a fresh demo. Hi Gandalf, i create my own Win7 and Win8PE SE but for my novice website visitors i placed a link to your pe page so that they can download your images. I don’t have enough webspace to do this and i don’t have a cloud drive or such and i don’t like these filehosting services and i do this cause you make a very good job. I downloaded your dual booting Win8.1PE, really well done! So, i hope i can make some of my visitors happy by placing a link to your pe page. Will the portable version of Virtual box run in this environment? it installed on the standalone x64 but requires a re-boot after the drivers are installed and since that is in ram all would be lost after a reboot. How can you seperate the 32-bit from the 64-bit version? Im using a multiboot tool and all i have tried does not support the dual version included here. Thanks for a great tool! HAve anyone had any success adding this to an USB with YUMI? I’m very dependant on having a multiboot tool as a tech, i need it about everywhere i go and this pre-installed enviorement really works for me and there are not many options out there for a good multiboot tool that can do as much as Yumi. I tried Xboot, but it seems to be discontinued. Sorry but I am not familiar with that program. Thank you very much for this great iso. This is the best PE I have seen by today.
. . . When using the “Try an Unlisted ISO option”, the ISO file name must contain no spaces. Check your iso name. For example ; Dual boot iso which I downloaded has got a space before letters ‘v1. 1’ . Remove all spaces before adding to yumi. Your problem was probably was this point.
. . . I advise using ‘Grub’ instead of ‘Syslinux’ for unlisted iso’s build with windows PE.
. . . Use Fat 32. Ntfs is not guarenteed.
. . . Don’t change usb volume label. Keep as MULTIBOOT. If you expect your distributions to boot. wincontig – GUI tool to defragment ISO files. Portable version is avalaible at the same page. 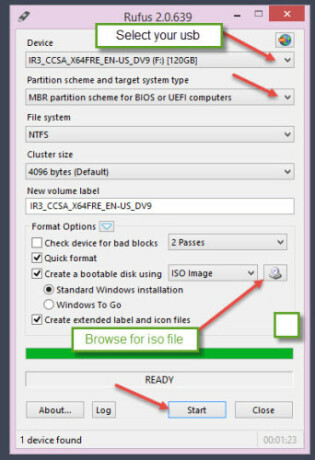 In the wincontig program, Just open your fragmented iso that you were warned about; in the multiboot\ISOS folder in your MULTIBOOT usb drive and defrag it.
. . . İt is only necessary for windows installation isos,but you can safely remove your your flash disk firstly before using yumi, to be sure. And, after plug it in and use. Hello! Congratulations for this wonderful release! Could you please make some tutorial about how to change keyboard layout? I wanna use it on daily basis but my keyboard layout is ABNT2, which includes many other chars like ~^´`ç etc. I think many other users will love it if you do it. Gandalf, thanks for your tool because I rely on it now because Hirens is a waste of time on later machines. Could you put all the .Net tools into your next version if they aren’t already? There’s many tools out there now that need .Net from either 2.0 to 4.5 and they can’t easily be run with your system. If it’s impossible to achieve from an image perspective is there a way to get it to work temporarily even? I am looking for someone with a different keyboard layout to test. Let me know what keyboard and locale you need. This is just for keyboard not language settings. Hi, just wondering if this can be booted from a usb drive using eufi or does it only support legacy boot? I don’t have a uefi system to test it on. But possibly some other users have tried and would know. Anyone? I tested it on a UEFI system and it booted normally. Great work! Love it! I am an IT Engineer and this PE versions helps in many ways. Can you add AOMEI BackUpper free version please? Very nice implementation. thank you for saving me the trouble of creating my own. I’m anxious to use it but I just can’t download it. Onedrive just seems to timeout. No error messages. Hmmm. Do you have problems with other large files? Same with me…OneDrive times out. Will not download. I don’t have problems downloading other files/websites. 32 bit winpe did not recognize my nic card. 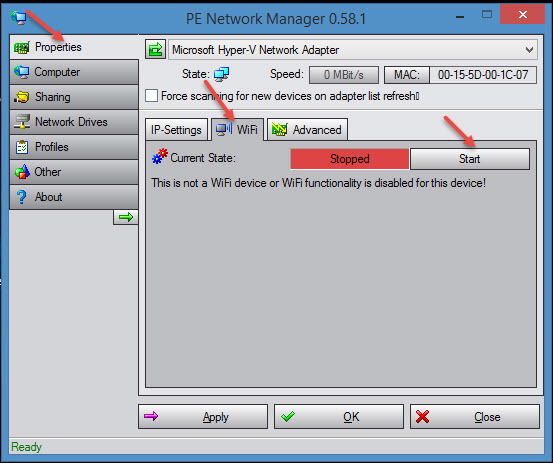 Tried to use PE Network Manager to manually load my nic but could not find where. If I use Properties tab on the left and select the Advanced tab, it does not switch any details from IP Settings or WiFi (which ever one was displayed last). Please provide steps to manually load nic drivers. how can i upgrade portable apps and put back into wim image? Unpack the wim-file with 7zip. Good afternoon, I have been searching forever to find some of the things you have accomplished with your dual boot PE.. I have a few things I would like to do to it to tailor it to my needs but it seems if any thing is altered in the boot.wim or boot2.wim the OS will crash on the way in. I assume that is by design? Could you let me know if there is a way I could make some alterations? Maybe gandalf50 could post his WinBuilder Project in a zip or 7zip format. That way you would be able to add to his design. For the sake of clarity, to create your USB dual bootable WinPE all I need to do is copy the ISO to my FAT32 USB stick? I used Rufus to create the bootable USB from your dual boot WinPE ISO and encountered an unexpected result on my Win8.1/64 UEFI system (RMPrepUSB gave the same result). After creating the bootable USB my HP-15 laptop booted directly into WinPE/64 but neither my mouse, touchpad nor keyboard worked. I was all dressed up with nowhere to go. Do you have an idea what I’m doing wrong? Thanks. Try setting the partition scheme on your Win8.1/64 UEFI to UEFI only. It normally picks up mouse and keyboard drivers, You may need dedicated drivers for your HP. If you’re referring to my BIOS settings, the boot protocol is already set to IPV4/UEFI. Legacy is disabled and Secure Boot is enabled. Those are really the only options related to UEFI. Glad you got it working. No battery detected may be a driver issue. I set the Rufus partitioning scheme to MBR/UEFI and to GPT/UEFI but encountered the same results. Perhaps my ISO is corrupted. Do you have an MD5 checksum I could confirm? Thanks again. OK, I’m seriously stuck and hoping someone can help. The original hard drive finally failed the day before I was set to clone it to a new hard drive, so the image is inaccessible thanks to a corrupted registry and an obnoxious 8.1 error. So I got recovery disks from Gateway, to install to the new hard drive. Well I keep getting this UEFI wall. It tells me I can’t run the system recovery without going into Legacy mode, then when we finally figured out how to force Legacy mode, it said these disks can only be installed in UEFI mode. So my sister suggests we grab a copy of WinPE from somewhere (not knowing how rare prebuilt copies are now), and see if we can work around the problem. So the new hard drive is in the machine, I’m booted fine with a USB version of your wonderful WinPE build, and I was going to run the system discs to install to the new hard drive. But the CD’s don’t have any standard executable I can run, and Autoplay appears to not be enabled in this build of WinPE, so the autorun.ini file won’t start. Is there a way to enable Autoplay on this build? If not, is there another tool or option you can suggest to work around the problem? Autoplay usually opens an executalbe or msi file. Open the autorun.inf with notepad and have a look a what file and its location that it runs, then go to that location and run it manually. if this windows support dial up modem connection? I don’t believe I included it. how to add dial up modem connection in this windows? This an amazing boot dvd!!! Actually, i’m not sure about how to achieve this project, but i’m counting on you to teach me if you mind!!! I would like to learn too, if you allow me. Please let me know how to help and add some other drivers to the image. Your “Win PE”s are all incredible and excellent work! It was lucky that I met your work. When I was looking for How to Use “Win8.1PE”, I found here. Coz, the “download center” says “you need to be connected on the internet to download files” and always fail on the task of making ISO. I made regular console base “Win 5.1 PE” as I followed Technet’s basic way. I gave up making “Win PE 5.1” with GUI by myself. So, I wanna use your lovely PEs. But I wanna also “customise” your work for me by myself. The “Customize” I mean, is just “Localization” of my natural language “JP-Ja”. If you have time, please tell me how to change Language of the Win PE shell for your compleated works “ISO” files. For a while, I use your “Win8.1PE” on the “en-US” localization. It would be great if you could add 32-bit UEFI boot support to the dual-boot ISO – at the moment it only boots on 64-bit UEFI systems. Hi Steve. I just noticed this. ;) Thanks better late than never. I am looking at doing that in newer version. Easy2boot looks like a good solution. Great work. I’d been pondering this path for a while now but looks like you’ve beaten me (and probably a lot of people) to it. Great work! Just wondering, did you document how you did this at all? May be for those adventurous of us out there might like to add and expand the tool set. Thanks. Documentation? What’s that? ;) Unfortunately documentation has never been a strength of mine. Some of my USB 3.0 SS does not work. Can you upgrade the drivers for it. Thanks. Is there a possibility of making a ULTIMATE USB with WIN8.1 and WIN10 versions andd Hirens Boot? But is there a possibility?? I just downloaded it (1.33 GB) and when copying it to USB stick from Rufus, it says “Error: ISO image extraction failure”. Try again with rufus or your download may be corrupt/incomplete. Thanks for a prompt reply. I’ll download it again. is that OneDrive link still valid? (the WinPE for windows 10 seems to work but the link for the windows 7 version seems to have a problem). – thanks ! the download link is not working any more, is there some update? Hello, please can upload the file again, the link no longer works.